The D-line refractive index along the length of this sample of amosite asbestos is about 1.703. It matches the refractive index of the Cargille High Dispersion 1.680 liquid at a wavelength of about 440 nanometers. At this wavelength the Cargille liquid has a refractive index of about 1.723, as does the amosite. This Type of Dispersion Staining produces a single color for any given wavelength match between a given liquid and solid with a fixed single linear polarizing filter. Oblique condenser darkfield dispersion staining produces the same colors as objective cental stop dispersion staining but the particles are in much better focus. As a result it is easier to see the particles that are producing the effect. Amosite asbestos is the fibrous form of amphibole in the cummingtonite-grunerite family. Its chemical composition is (Mg, Fe, Mn)7[Si8O22](OH) 2. It is the next most common commercial asbestos after Chrysotile. Amosite is a hazardous material and exposure should be very carefully limited. It is one of the more hazardous of the asbestos minerals. Amosite asbestos was used primarily for boiler and steam pipe insulation and for sound proofing products like acoustic ceiling tile. It is not a common form of amphibole and so its presence in the environment generally indicates the disturbance of an asbestos containing construction material. 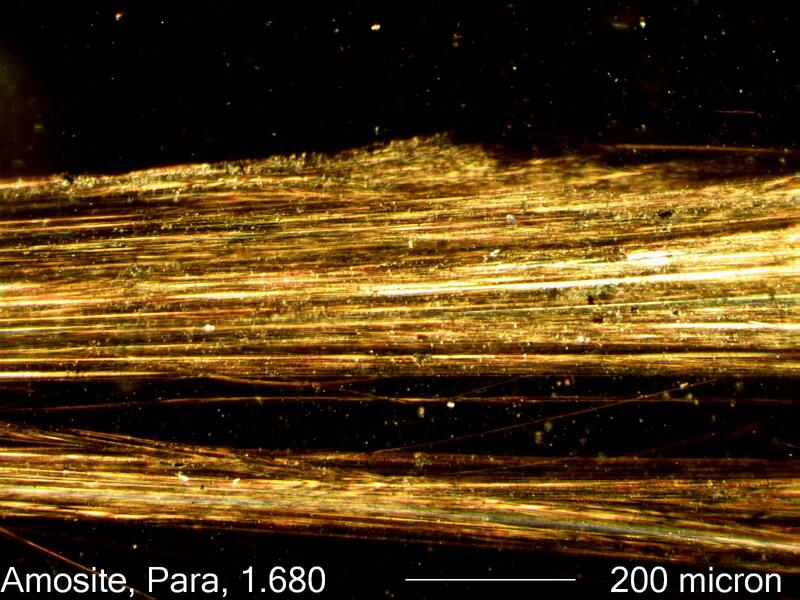 Amosite fibers tend to be straight and are rather stiff. The fibers tend to be bundles and the terminations are often Well broomed. They show good dispersion colors when dispersion staining is used and they are mounted in a high dispersion 1.680 refractive index oil. The two most common non-fibrous materials that amosite is associated with are magnesia and gypsum. A very common block form of insulation containing amosite was simply designated as Magnesia 80. It is 80% magnesia (magnesium oxide) and 20% asbestos. The asbestos content ranges from 20% amosite to various blends of amosite and chrysotile. The gypsum formulation was similar though often calcite (limestone) would be blended into the gypsum. When used in acoustic ceiling tile it is generally mixed with glass fiber and an epoxy binder.